The Ryobi scroll saw is a 16-inch, electric scroll saw with deep cutting capacity. Like most other scroll saws in this category, this Ryobi scroll saws ticks all the boxes and doesn’t leave out a feature most people except at this price point. Equipped with variable speed capabilities, the saw also has an integrated blower that keeps the cut-line clear for accuracy. 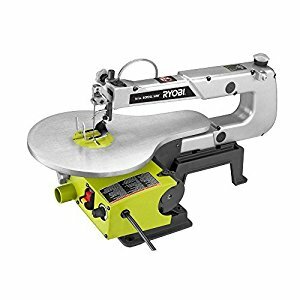 In this Ryobi scroll saw review, we’ll look at the advantages and drawbacks of this scroll saw and determine whether it’s the best scroll saw for all types of users, or does it only cater to a specific user group. For the price, the LED light quality of this scroll saw is quite impressive. It should be good enough to carry out light woodworking tasks. The saw is surprisingly versatile and easy to use. It works at different speeds effectively. When set at a particular speed to cut a specific material, you need not change speeds. And you may stop and start the saw at will, without fearing loss of work piece control. You may have to pay additional money for the foot switch if you want this scroll saw to work optimally. Changing, installing and moving blades can consume time initially. But once you get used to the process, it should be a breeze thereafter. And contrary to what the company claims, blade-changing is not tool-less. Most users would need their pliers to loosen the small hand knob. There’s little vibration, which gets aggravated at higher speeds. In fact, when working at high speeds, the saw tends to move a fair bit. You need to bolt the scroll saw down to mitigate such movements. • How difficult or easy is changing blades? Changing blades isn’t the most convenient here. You may have to tilt the table a bit for accessing the blade holder bottom. • What’s the maximum wood thickness this saw can manage? The wood thickness levels this saw can manage is dependent on the hardness of the wood. Hard woods up to an inch should not be a problem. Two-inch thick wood should be the maximum in case of soft woods. • What voltage does this saw run on? The saw uses 110V for power. • Does this saw work with spiral blades? Yes, it does, provided the blades fit in. • Will this saw work with “dead man switch”? The saw can work with a dead man switch; there is a built-in mechanism to attach the key to the switch. This scroll saw review would have probably helped you realize that this saw isn’t made for everyone. But there’s not much to complain here since the saw is priced at the lower end of the spectrum. In fact, for the price, this saw is more than just plain effective. People who are buying this saw as an entry-level device would be quite satisfied. Initially, you may face some difficulties using this saw and may be questioning your purchase decision. But once you get to know the saw more, these thoughts should disappear.